A higher percentage of Asian students (45 percent) earned their highest math course credit in calculus than students of every other racial/ethnic group. The percentage earning their highest math course credit in calculus was also higher for White students (18 percent) than students of Two or more races (11 percent), Hispanic students (10 percent), and Black students (6 percent). As part of the High School Longitudinal Study of 2009 (HSLS:09), high school transcripts were obtained in 2013 from a nationally representative sample of both public and private school students who were 9th-graders in 2009.1 Transcript data provide an account of the high school courses in which students earned credits. One credit is the equivalent of a year-long course of study. This indicator examines the average number of credits students earned in different academic subject areas by students’ race/ethnicity. It also examines differences by students’ race/ethnicity for the highest mathematics and science courses in which they earned credit. NOTE: High school transcripts were obtained in 2013 from a nationally representative sample of students who were ninth-graders in 2009. Estimates include ninth-graders who dropped out or did not obtain a high school credential by 2013. STEM refers to science, technology, engineering, and mathematics. Race categories exclude persons of Hispanic ethnicity. Although rounded numbers are displayed, the figures are based on unrounded estimates. SOURCE: U.S. Department of Education, National Center for Education Statistics, High School Longitudinal Study of 2009 (HSLS:09), First Follow-up and High School Transcript Study Public-Use File. See HSLS:09 2013 Update and High School Transcript Study: A First Look at Fall 2009 Ninth-Graders in 2013, table 3. STEM-related courses include core coursework in math, science, computer and information sciences, as well as engineering and technology. Asian students earned more high school credits in math (3.9 credits) than students of every other racial/ethnic group.2 Additionally, White students earned more credits (3.7 credits) than Hispanic students (3.5 credits) and students of Two or more races (3.5 credits). Asian students earned more credits in science (3.9 credits) than White students (3.4 credits), and both Asian and White students earned more credits in science than students in any other racial/ethnic group. 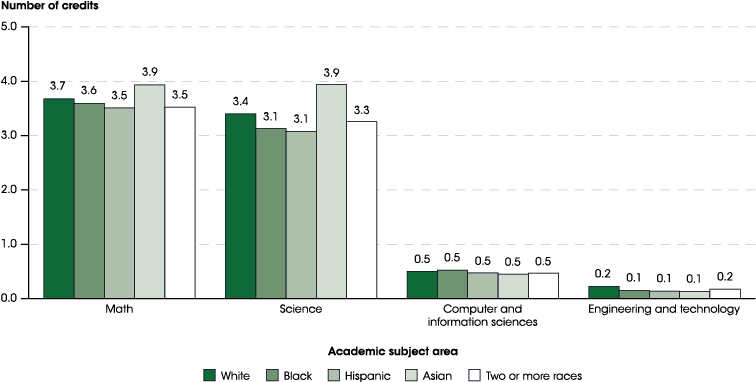 There were no measurable differences in the number of credits earned in computer and information sciences by racial/ethnic group. White students earned more credits in engineering and technology (0.2 credits) than students in any other racial/ethnic group. Non-STEM related coursework includes subjects such as English, social studies, foreign language, and fine arts. White students earned fewer credits in English (4.0 credits) than Asian (4.2 credits) and Hispanic students (4.1 credits). Asian students earned more credits in social studies (3.9 credits) than students of all other racial/ethnic groups. In addition, White students earned more credits in social studies (3.7 credits) than students of Two or more races (3.6 credits), Hispanic students (3.5 credits), and Black students (3.4 credits). Similarly, Asian students earned more credits in foreign language (2.4 credits) than students of all other racial/ethnic groups. White students earned more credits in foreign language (1.9 credits) than Hispanic students (1.8 credits), and students in both groups earned more credits than Black students (1.6 credits). White students earned more credits in fine arts (2.0 credits) than Asian students (1.8 credits), and both groups earned more credits than Hispanic students (1.6 credits) and Black students (1.5 credits). Additionally, students of Two or more races earned more credits in fine arts (1.9 credits) than Hispanic students and Black students. NOTE: High school transcripts were obtained in 2013 from a nationally representative sample of students who were ninth-graders in 2009. Estimates include ninth-graders who dropped out or did not obtain a high school credential by 2013. Race categories exclude persons of Hispanic ethnicity. SOURCE: U.S. Department of Education, National Center for Education Statistics, High School Longitudinal Study of 2009 (HSLS:09), First Follow-up and High School Transcript Study Public-Use File. See HSLS:09 2013 Update and High School Transcript Study: A First Look at Fall 2009 Ninth-Graders in 2013, table 2. Career and technical education (CTE) includes vocational education courses, as well as courses that teach general life or employment skills. White students earned more credits in CTE (3.2 credits) than students of Two or more races (2.9 credits), Hispanic students (2.6 credits), and Asian students (2.2 credits). There were no measurable differences in the amount of CTE credits earned by White students and Black students (2.9 credits). Asian students also earned fewer CTE credits than students of Two or more races and Black students. ‡ Reporting standards not met. The coefficient of variation (CV) for this estimate is 50 percent or greater. 1 Includes basic math, applied math, other math such as history of math and mathematics–test preparation, and pre-algebra. 2 Includes integrated math, trigonometry, algebra III, probability and statistics, and noncalculus Advanced Placement (AP) or International Baccalaureate (IB) courses. NOTE: High school transcripts were obtained in 2013 from a nationally representative sample of students who were ninth-graders in 2009. Estimates include ninth-graders who dropped out or did not obtain a high school credential by 2013. Race categories exclude persons of Hispanic ethnicity. Although rounded numbers are displayed, the figures are based on unrounded estimates. Details may not sum to 100 because of rounding. SOURCE: U.S. Department of Education, National Center for Education Statistics, High School Longitudinal Study of 2009 (HSLS:09), First Follow-up and High School Transcript Study Public-Use File. See HSLS:09 2013 Update and High School Transcript Study: A First Look at Fall 2009 Ninth-Graders in 2013, table 4. In addition to examining the average number of credits earned in a particular subject area, transcript data can provide information on the specific math courses (e.g., algebra I, geometry, calculus) that students took while in high school. Math courses were coded using a common classification system and students were placed into groups based on the most difficult, or highest, course in which a student earned credit. A higher percentage of Black students earned no credit in math courses in high school (3 percent) than Hispanic students (1 percent) and White students (1 percent). There were no measurable differences in the percentages of White, Black, and Hispanic students and students of Two or more races who earned their highest credit in a math course below algebra I. A similar pattern was evident for students whose highest math course was algebra I, except that the percentage of Hispanic students (6 percent) was higher than the percentage of White students (4 percent). The percentage of Hispanic students for whom geometry was their highest math course (17 percent) was higher than that for students of Two or more races (11 percent), Black students (9 percent), White students (9 percent), and Asian students (4 percent). The percentage of students whose highest math course was algebra II was lower for Asian students (11 percent) than students of all other racial/ethnic groups. The percentage of students who earned their highest math course credit in some other math course was higher for Black students (32 percent) than students of all other racial/ethnic groups. A higher percentage of White students earned their highest math credit in precalculus (22 percent) than Hispanic students (17 percent), students of Two or more races (16 percent), and Black students (16 percent). The percentage was also higher for Asian students (22 percent) than students of Two or more races and Black students. A higher percentage of Asian students (45 percent) earned their highest math course credit in calculus than students of all other racial/ethnic groups. The percentage earning their highest math course credit in calculus was also higher for White students (18 percent) than students of Two or more races (11 percent), Hispanic students (10 percent), and Black students (6 percent), and lower for Black students than students of Two or more races and Hispanic students. 1 Includes earth science; general life or physical science; first-year biology, chemistry, and physics; integrated and unified science; and general science courses such as origins of science and scientific research and design. 2 Includes courses such as geology, botany, zoology, and independent studies in biology, chemistry, and physics. 3 Includes advanced studies in biology, chemistry, and physics. 4 Includes Advanced Placement (AP) or International Baccalaureate (IB) courses (except IB Middle Years Program courses). NOTE: High school transcripts were obtained in 2013 from students who were ninth-graders in 2009. Estimates include ninth-graders who dropped out or did not obtain a high school credential by 2013. Race categories exclude persons of Hispanic ethnicity. Although rounded numbers are displayed, the figures are based on unrounded estimates. Detail may not sum to 100 percent because of rounding. SOURCE: U.S. Department of Education, National Center for Education Statistics, High School Longitudinal Study of 2009 (HSLS:09), First Follow-up and High School Transcript Study Public-Use File. See HSLS:09 2013 Update and High School Transcript Study: A First Look at Fall 2009 Ninth-Graders in 2013, table 6. Science courses were also coded using a common classification system and students were placed into groups based on the most difficult, or highest, course in which a student earned credit. A higher percentage of Black students (3 percent) and Hispanic students (3 percent) earned no credit in science courses in high school than White students (2 percent). A lower percentage of Asian students (28 percent) earned their highest science course credit in general science than students of all other racial/ethnic groups. The percentage was also lower for White students (42 percent) than Hispanic students (50 percent) and Black students (49 percent). A lower percentage of Asian students (24 percent) earned their highest science credit in specialty science than students of every other racial/ethnic group. A higher percentage of White students (6 percent) earned their highest science credit in advanced studies than students of Two or more races (3 percent), Hispanic students (3 percent), and Black students (3 percent). The percentage of Asian students (40 percent) who earned their highest science credit in Advanced Placement (AP) or International Baccalaureate (IB) science was higher than the percentage of White students (16 percent), and both these percentages were higher than the percentages of every other racial/ethnic group. Additionally, a higher percentage of students of Two or more races (12 percent) than Black students (8 percent) earned credit in AP or IB science as their highest science course. 1 In some measures of coursetaking, high school dropouts were included, while they were excluded in others. See figure notes for more detail. 2 The racial/ethnic groups included in this indicator are White, Black, Hispanic, Asian, and Two or more races. Students of All other races were excluded from the comparisons between racial/ethnic groups made in this indicator.